No food history today. Today's post by my friend, Judy from http://thesouthernladycooks.com. Thank you, Judy for being a guest on Christine's Pantry, and thanks for sharing your recipe. Hello! 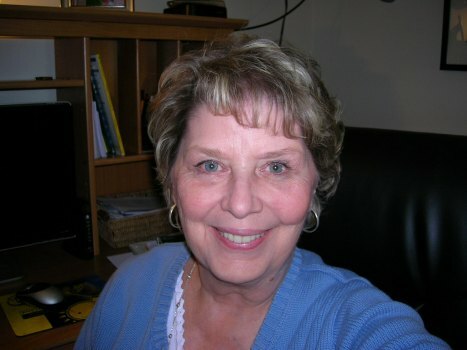 My name is Judy and I am the lady behind the blog and Page on Facebook, The Southern Lady Cooks. First of all thank you so much to Christine for inviting me to be a guest of Christine's Pantry today. Christine's blog is one of my favorites. I live in the Bluegrass State of Kentucky where I retired from a job in state government. I am a "Mom" to three wonderful adult children; twin daughters, Anne Parker and Leigh Harper, and a son, Charles Robert. A beautiful daughter-in-law, Sarah, and a 4 year old grandson, Thomas Wyatt. I call him Tater Tot! Blogging, along with lots of other hobbies, keeps me busy. I love meeting new people and love to cook down home Southern recipes. Southern folks love company, love to eat and love the South and that is what my blog is all about. I hope you will enjoy the recipe I am bringing to you today. This recipe for Woodford Pudding is a Kentucky recipe that has been around since 1835. 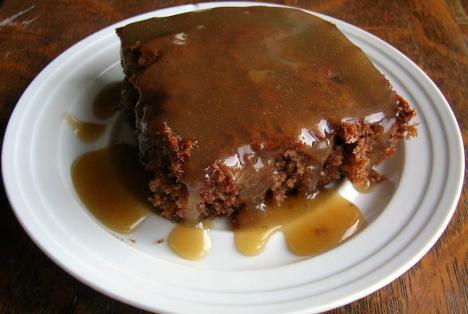 The spongy, spiced pudding is named after Woodford County in Kentucky. John Egerton speaks about Woodford Pudding in his book, “Southern Food”. Combine sugar and flour in saucepan. Add boiling water and salt. Mix well with spoon or whisk. Bring to a boil on stove. Cook to desired thickness, about five or six minutes. If too thick add more boiling water. Remove from heat, add butter, milk and vanilla and stir. Serve pudding warm with sauce on top. Enjoy! Fantastic and delectable pudding! Thanks Judy and Christine for introducing us to this treat..
Beautiful pudding and love that butterscotch sauce on top. Thanks to Judy for kindly sharing her recipe with us. That looks scrumptious. I bet it's good with morning coffee. Wonderful post! Blackberry jam & butterscoth sauce, sounds like a fantastically delicious combo! Hi Judy it's a pleasure to meet you and thanks for sharing your recipe. I love blackerries and I think this wiil be my kind of treat. Well, HELLO Southern Lady Cooks! SO nice to meet you! What a great pudding - rich and decadent....while I'm allergic to cinnamon and allspice and can't indulge, I have to say I LOVE that it has that and blackberry jam....how cool are you?! Christine - another great guest blogger - thanks! I love homey desserts, and this looks perfect for fall! Great guest post from a fellow KY Food Blogger! This pudding sounds absolutely delicious! You guys are awesome. Thanks for stopping by and leaving your kind comments. Thank you so much, Judy for being a guest. Thanks to Christine and all her wonderful blogger friends for these great comments. It was so nice to meet you all and be a guest blogger on this site. The pudding looks absolutely delicious. What a sweet-looking dessert. I can see the wide-eyed looks in my families eyes if I present this after dinner. This looks yummy, and the blackberry jam is interesting sounding. Thanks for sharing. Welcome, Judy! I've never heard of this before, but it looks delicious!! I have never heard of Woodford pudding..... It looks super tasty but once I read Woodford I kept thinking it was going to have Woodford Reserve in it somewhere. Little did I know it would be this tasty looking dessert instead. Nice to meet you Judy - thanks for sharing your pudding with us! Nice to meet you Judy! I've never heard of Woodford Pudding but it sounds divine! Putting it on my list & I can't wait to try it!! Some adore citrus and others are chocolate freaks but I can't get enough of butterscotch. If I could make this every day I would! Love the delicious pudding...especially the yummy gooey, butterscotch sauce. Wonderful guest post! Great guest post. I must hop over and check out Judy's blog. Such a wonderful recipe. My kids would love this one. Thank you very much for all your kind comments. This cake would be wonderful with a cup of coffee, and with the blackberry jam, Yum! Sometimes these old treasured recipes are the best! Thanks for sharing! Christine. Thanks for another great guest blog. The pudding looks rich and delicious! Thanks, Judy, and Christine, for this wonderful recipe. Yum! I love cinnamon with chocolate. This sounds awesome! Judy, the recipe is unbelievably delicious! Love the combination of ingredients and flaors! Yummy! I have never heard of this type of pudding but it sounds amazing and looks delcious! good to make your acquaintance Judy and I have to say that cake recipe wins me over. I have never seen this before but wow it looks amazing. That butterscotch sauce would make my bf swoon. Thanks for sharing! Wow, looks wonderful! I needed this for my chocolate craving last night!